Was Theophilus the high priest a friend of the Apostle Paul and Luke? The death of Yacov called Jacob (James the Just) was an absolute shock to the members of the Hebrew Nazarene Ecclesia or the messianic Jewish believers in Jesus in Jerusalem. James the Just had been the central foci of justice, peace and stability to the whole region for over thirty years. Throughout all the political avalanches that swept across the Jewish society, here was one man who held the respect of every aspect of societal culture in the Province of Judea except the member of the House of Ananus. Ananus the Elder, the ‘patriarch’ of this very powerful, evil and controlling Sadducean family, held the office of the high priest within the grips of their family for thirty three out of thirty five years between the years of 6 CE and the beginning of the reign of Herod Agrippa I (41-44 CE). Ananus the Elder had been around a long time. The first evidence of Ananus’ priestly and scribal duties were possibly recorded in the Protoevangelium of James, a work which is attributed to James the Just the brother of Jesus. In this document, a young temple scribe, Annas confronted Joseph and newly pregnant Mary and then reported them to the high priest. He was accusing them of violating the betrothal vows of the Jews. Twelve years later we find an Ananus who is now inaugurated in 6 CE as the high priest in the Temple of Herod in Jerusalem. At Passover of this same year we also see Yahshua (Jesus), the son of Yosef (Joseph) and Miriam (Mary) going into the temple in the year of His bar Mitzvoth and meets with the newly appointed high priest Ananus the High Priest and the elders of the Great Sanhedrin. This meeting was anticipated as Yahshua (Jesus was destined to someday sit on the hereditary ‘seat of David’ as one of the elders of Israel in the Sanhedrin in the place of his great uncle, Joseph of Arimathea. The family of Ananus and the family of Yahshua (Jesus) would traverse the entire religious and political landscape of Judea until the death of Yahshua’s brother, Yacov haTzaddik (James the Just). Just after this, the final escape of the Hebrew Nazarenes with their new high priest, Simeon ben Clopus, the cousin and possible half-brother of Yahshua, from Jerusalem occurred about 66 CE, just prior to the arrival of the Roman legions of Vespasian. Let us propel ourselves all the way to 62 CE and now we find Ananus the Elder’s son who was called Ananus the Younger bringing James the Just to the steps of the temple during the Sabbatical Passover. He knew that James’ answer to his questions would bring forth the charges of blasphemy by the members of the Sanhedrin that were there to listen and observe. Why? Ananus, son of Ananus the Elder wanted to destroy James the Just and do it under the their interpretation of the Torah law by stoning him to death. Here we find a son, who was named after his father Ananus the Elder, who appeared to be a clone of all the evil of his grandfather. We also are introduced to the new Roman governor, Flores, who was one of the worst governors in the history of Jewish-Roman relations. On the other hand the Zealots, the Sicarii, plus all the other brigands, robbers and pillagers of the people created such chaos in the country that it appeared that no sanity or civility was left in the Holy Land. Peter was later crucified upside down in the same Circus of Nero that Paul had met his fate one or two years earlier. The body of Peter, minus his feet, was gathered by the weeping saints in Rome and carried to the slopes that surround the Circus and there they buried him in a grave where a memorial to the Apostle Peter exists to this day beneath the high altar of St. Peter’s Cathedral. The Emperor Nero was on a warpath against the Christians and Nazarenes in the city of Rome. The cenotaph or burial monument to the Apostle Peter in the catacombs of St. Peter’s Cathedral at the Vatican. The future of the leaders of the church was yet unknown. All they knew was that the Lord of hosts had put them in a great dividing time. The death of James the Just occurred at the Sabbatical Passover in the year 62 CE. John, Peter and all the other living apostles that were able to return were in Jerusalem at this high and holy season of the Jewish religious life. 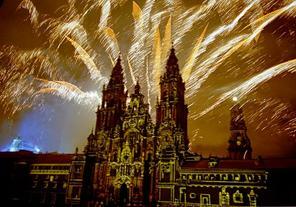 Forty days later the festival of Pentecost came. During this time the Nazarenes were to convene for the Supreme Council of the Nazarenes which by all historical documentation occurred every seven years during the same time when every Jewish male in the Diaspora would travel to Jerusalem for the Sabbatical Year festival Passover and Pentecost season. Here they came together in holy convocation to commemorate the gift of the early rain that Yahshua had left them with the coming of the Holy Spirit in the visible tongues of fire. Here they came to conduct the business of the Ecclesia. Here now they came to discuss the future leadership of the Nazarenes. The Jewish temple authorities were in a progressive state of discontent. Omens appeared to be telling them at that time that their temple services and the lives that they lived were displeasing to their Lord. The Nazarenes continued to grow and prosper under the leadership of James the Just. It was probably at one of these Sabbatical Supreme Councils of the Nazarene Sanhedrin that the Apostle Paul in 48 CE met with them according to Acts 10 and wrote out the Jewish Nazarene halachah. It was here the rules of the Ecclesia would be written on how the Gentile Christians would upon the acceptance of the Noachian Laws become ‘adopted’ as proselytes into the Jewish Nazarene Ecclesia. 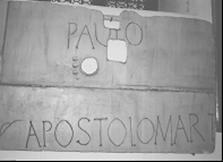 Seven years later in 55 CE, the Apostle Paul returned from his third missionary journey. When he arrived, just in time for the Nazarene Supreme Council convocation at Pentecost, he first went to the temple for his purification rites. There in the temple certain Jews began a revolt and attempted to stone Paul to death. Then again another seven years later on the Sabbatical Passover at 62 CE., James the Just was murdered in the temple by the temple priests themselves under the direction of the high priest Ananus the Younger, the son of Ananus the Elder. 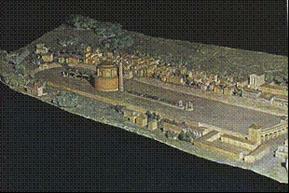 The body of James the Just was thrown over the ramparts of the temple to the Kidron Valley below. As the blood-brother of Jesus, for thirty two years (30 -62 CE), James the Just was the living legacy of his brother, the Jewish Messiah who was exalted by his resurrection and now recognized as “sitting on the right hand of God”. As a Jewish Tzaddik or Righteous one, Jacob’s fame spread throughout all Judea for his purity before the Law, his wisdom in judgment, and his undying love and care for the people of his nation. He was a man of the nation, a man of the people, and a true servant of God. As the Nazarenes watched their leader being clubbed to death by the allies of the high priest, Ananus whose father, Ananus, the high priest emeritus, was most responsible with his son-in-law Caiphas the high priest for the death of Jesus, it was in their grief as if they were witnessing again the death of their Messiah. According to Hegesippus, they buried him on the spot where his memorial stone still remains, close to the temple.” (Schonfield, Hugh Joseph, The Pentecost Revolution, The Story of the Jesus Party in Israel, AD 36-66, Macdonald and Janes’s, St. Giles, 49/50 Poland Street, London, W.I., 1974, p238 ). There outside the walls of the walls of the temple in the Kidron Valley below, the members of the Nazarene Ecclesia loving gathered the body of their revered leader and buried James the Just according to tradition in the monument, known today as Absalom’s Pillar. This ancient monument is now recognized to be the resting place of two other Tzaddiks of the Nazarenes, Zechariah the priest and Simeon the Righteous (Tzaddik). Zechariah was the father of John the Baptist and Simeon was the Righteous priest who with the babe Yahshua in his arms pronounced the most beautiful oracles on the life and destiny of this anointed One. 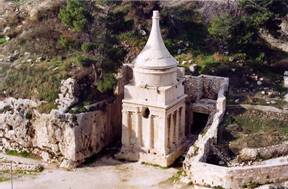 Here in this beautiful mortuary monument near the Kidron Valley, archeologist have now discovered ancient graffiti inscriptions that testify that this tomb was built to commemorate the death of Zechariah the priest and Simeon the Righteous (Tzaddik). 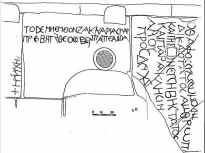 A horizontal inscription of 47 letters which is 1.2 meters long and 10 cm. high reads as follows: "This is the tomb of Zacharia, martyr, a very pious priest, father of John,"
The Zacharia inscription on the upper left and the Simon the Elder inscription on the right on Yad Avshalom (Tomb of Absalom). A second vertical inscription on the monument states that this is the tomb of "Simeon who was a very just man and a very devoted old (person) and waiting for the consolation of the people." Symeon ben Clopus was known as Simeon ben (son of) Clopas, Cleopas or Cleophas which is the Greek abbreviated form of Cleopatros). He was recognized as an able and very capable leader. According to Hegesippus, he was recognized as the first cousin of Jesus and Jacob (James), as his father Cleopas was the brother of Joseph, the father of both of these brothers. Some scholars have suggested that Simeon was nominated when the Hebrew Nazarenes returned to Jerusalem after the destruction of the temple in 70 CE. It was Eusebius, writing the above testimony, who claimed that he was working off the manuscripts of Nazarene scholars more ancient to him. Yet the historical documentation suggests that the nomination of Simeon ben Cleophas was expedited soon after the death of James the Just. It is also of interest that three centuries later, the Hebrew Nazarene hierarchical structure was being viewed in the language of the 4th century Roman Christian Church. Neither James the Just nor Simeon ben Cleopas were nominated as bishops of the ecclesia of Jerusalem. The seat of the bishopric did not exist, neither did churches. They worshipped in the Hebrew Nazarene Synagogue and their leader was the nasi or president of the Ecclesia and served as their high priest. 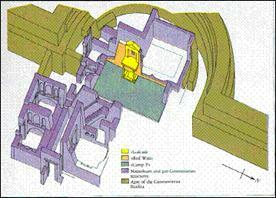 Bishops, bishopric and churches were inventions of the much later ascendant Roman Christian Church. According to Hegesippus, it was a ‘Rechabite priest’ who cried out, “Stop”! Yet according to the Hebrew scholars on Jeremiah 25, even though the Rechabites were adopted into Israel, there is no evidence that they could have ever provided any Levitical priests. 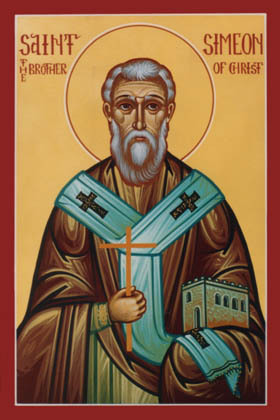 It was the fourth century historian Epiphanius in his treatise, “Against Heresies”, who stated that this person was actually Simeon, the son of Clopas, instead of the Rechabite priest. This statement sounds rather final that the destruction of Jerusalem occurred to avenge the death of God’s servant who was his appointed high priest in the temple of Herod. There was one problem. This quote cannot be found in any of the current writings of Josephus known today. The church historian for Constantine the Great, Eusebius cited this quotation from the Patrist church father, Origin, who wrote it in his treatise “Against Celsius” (1:47). Origin in turn was quoting Josephus. Even Origin appeared to be surprised that it was common knowledge amongst thinking Jews that the effect of the death of James the Just was seen as the moment in time in which God closed the doors of mercy to the Jews and Jerusalem and the city and temple were destroyed. Josephus - “In short, none could now speak his mind, with tyrants on every side; and from this date (death of James the Just) were sown in the city the seed of its impending destruction (halosis)” (Josephus, Jewish Wars, Book II, 272-6 cited in Schonfield, Hugh Joseph, The Pentecost Revolution, The Story of the Jesus Party in Israel, AD 36-66, Macdonald and Janes’s, St. Giles, 49/50 Poland Street, London, W.I., 1974, p 218 ). It would be four years later when the revolt against the Roman would officially begin. What they did not know that this would be the last Sabbatical Passover year that they would ever meet together in Jerusalem. Seven years later the city of Jerusalem would be surrounded by the Roman legions and one of the worst sieges in ancient history. Millions of Jews visiting from the diaspora would be trapped within its walls. And as Eusebius stated, “those of the apostles and disciples of the Lord who were still alive assembled from all parts together” and were able to elect the next generation of leaders that would take them through a time of trouble that never was anticipated. Yes, this would be their last Sabbatical Passover in Jerusalem, their last Sabbatical Pentecost in Jerusalem. This would be the last time that they would meet together in an international convocation of leaders with the Sanhedrin of the Nazarenes in their synagogue that stood at Sion, in their city of Jerusalem which the God of Israel claimed as His own. That Simeon was the son of Cleopas and recognized to be the cousin of Jesus is truly attested in history. The genealogical link was accounted by Hegesippus according to Eusebius, because Cleopas, the father of Simeon and Joseph, the father of Jesus were brothers. According to Jewish law, with the death of Joseph, his brother, Cleopas, would become the legal heir to claim the widow, Mary the mother of Jesus to be his wife. So the journey on the road to Emmaus after the crucifixion or hanging of Jesus was actually a dialogue between Uncle Cleopas, who did not recognize his nephew Yahshua ben Yosef (Jesus son of Joseph) as they walked on the road to Emmaus. Evidently that is the case, as genealogical history records that Simeon was the cousin to Jesus through different fathers, Cleopas vs. Joseph. But Jesus and Simeon could possibly also have been half-brothers if Mary, the mother of both Jesus and Simeon had truly remarried her husband’s brother as allowed by Torah law. How could this be? Trying to piece the fragments of the history of the Hebrew Nazarenes brings us back to the where Mary appears in the canon in the presence of Jesus’ “brethren” called James, Joses, Simeon (Simon) and Judas. Matthew 13:55-56 – “Is this not the carpenter’s son? Is not His mother called Mary? And His brothers James, Joses, Simon, and Judas? And His sisters, are they not all with us? In this text we meet Mary who was identified with the four brothers of Jesus and at least two sisters. Is it fair to notice that one of these brothers was named Simeon and another named James? Are we seeing in the gospel text evidence of James the Just and Simeon ben Cleopas? After this we find that Mary, the mother of Jesus disappears from all Biblical records after Pentecost as recorded in the Book of Acts. Yet we still see the trace of a Mary Cleopas leaving a historical trail with her burial on the coast of France, at Les Saintes Maries about forty miles southwest of Marseilles France. Was Mary Cleopas and Mary the mother of Jesus the same person? As a second option we have to ask the question, was Mary Cleopas the daughter of Cleopas and Mary the mother of Jesus? If so, did Mary Cleopas the half sister of Jesus and full sister of Simeon ben Cleopas remain as a vital member of the Nazarene Ecclesia and become a missionary to the southern coast of France near the city of Marseilles? Even that may not be true for a third option may be that Mary Cleopas and Simeon ben Cleopas could have been brother and sister, both son and daughter of Cleopas by a different wife and both were cousins of Jesus. So the true story is still not fully known. The election of Simeon to the throne of the Hebrew Nazarene Ecclesia was not uncontested. There was also another candidate, Thebouthis, described by Hegesippus as also being "another cousin of the Lord." (Eusebius, Ecclesiastical History 4:22, 4ff) Here we begin to see the makings of a dynasty of the family of Jesus being the religious heirs to the leadership of the Hebrew Nazarene Ecclesia. Yet, being a relative of Jesus was no guarantee of religious purity of the transmission of thoughts and words of Jesus. According to Eusebius we find that very early in the nominations for leadership position, was also the seed for abuse of power, greed, corruption and religious ideologies that were alien and foreign to the ministry and mission of Yahshua. Eusebius – “After James the Just had suffered martyrdom like the Lord and for the same reason, Symeon, the son of his (James’s) uncle Clopas, was appointed bishop, recommended by all as the Lord’s cousin. Who was this Thebouthis, the cousin of Jesus? To date history has not revealed this fact. Whereas James the Just sought to live a life fully for God, being a part of the family of Jesus did not guarantee that other members of His family did not conceive what power that a dynasty of the members of Jesus’ family could have. Had they not watched the apparent successful use of power and control by one family in the politics of the Jewish religion for over thirty years? Without achieving the mantra of authority which he sought, Thebouthis, according to Eusebius’ testimony, set up his own sects or groups of followers around himself. These would eventually come to be recognized as the seven heresies. The family dynasty of Jesus did produce great leaders and Simeon (Simon) was no exception. Not only was he a leader, but he was also probably a scholar. It was the 4th century Christian historian, Epiphanius, who described that in the city of Tiberius, Jewish scholars had three ‘Christian’ books called, the Gospel of the Hebrews or possibly known as the Hebrew Matthews, the Ascents of Jacob which Epiphanius called the ‘Falsified Acts’, and the Book of John. From all appearances, these three books according to Christian sources were actually Nazarene books. It was the Jewish historian Schonfield who claimed; according to later Jewish sources they could trace these three books to the pen of Simeon ben Calpus (Cleopas). (Schonfield, Hugh Joseph, The Pentecost Revolution, The Story of the Jesus Party in Israel, AD 36-66, Macdonald and Janes’s, St. Giles, 49/50 Poland Street, London, W.I., 1974, p234 ). Though these books have been lost and their traditions are garbled and known only in part, they still are a reminder that the ancient history of the Hebrew Nazarene Ecclesia though visible are but glimpses of a history still not fully told. “a certain aged man from among the Elders… who frequented the Holy of Holies.’ (Schonfield, Hugh Joseph, The Pentecost Revolution, The Story of the Jesus Party in Israel, AD 36-66, Macdonald and Janes’s, St. Giles, 49/50 Poland Street, London, W.I., 1974, p 234). In this one statement, this aged man is identified as Simeon ben Calpus and in another he is called Simeon Cepha. Yet according to the Codex Strasburg he was called Cephas, not because he was mixed up with the better known Simeon Cephas also known as the Apostle Peter, but because Simeon ben Cleopas “stood upon the stone (‘cepha’) whereon Ezekiel prophesied by the river Chebar, and on that stone there came to Simeon a voice from heaven” (Schonfield, Hugh Joseph, The Pentecost Revolution, The Story of the Jesus Party in Israel, AD 36-66, Macdonald and Janes’s, St. Giles, 49/50 Poland Street, London, W.I., 1974, p241). Earlier we discovered in the testimony of Eusebius, the Roman Church historian for Constantine the Great that James the Just the brother of Jesus and the cousin and probably half-brother to Simeon ben Cleopas not only was a Nazarite and the leader of the Nazarenes, but he served in the temple of Herod as the high priest of the Hebrew Nazarene Ecclesia. At the same time we have to consider that James the Just and Jesus had the same father, but possibly different mothers. On the other hand, we have to consider that Simeon and Jesus with James the Just had different fathers who were brothers and possibly different but possibly the same mother. Like James the Just, Simeon evidently came also from a recognized priestly lineage and served as the oppositional high priest who entered the Holy Place during Yom Kippur in 63, 64, and 65 CE much like his half brother or cousin James the Just did earlier. It must be assumed that Simeon ben Cleopas was part of the vibrant matrix of the growth and development of the Hebrew Nazarene Ecclesia in Jerusalem. He would have been a participant and a disciple of his cousin, Jesus the Nazarene, who as a Rabbi of Israel was taken captive, sent through a mock trial by the Sanhedrin and sentenced to death. Simeon ben Cleopas would have also been very intimately acquainted with the House of Ananus for one thing that was certain, all the members of Jesus’ family were known by the temple hierarchy. The family of the House of Ananus was quite secure. They were the most powerful family in Judea and the wealthiest. Their fame was known throughout the length and breadth of the Roman world. On the other hand, Yahshua, born in the home of a Davidian family were also well known. The uncle of Jesus, Joseph of Arimathea was reputed to one of the wealthiest men in Judea. He was the full brother of Mary’s father, Heli, also known as Joachim or Eliachim. He was recognized as one of the Elders of the Great Sanhedrin and a member of the Roman Provincial Council of Judea and a Roman decurion in charge of the tin mines on the Cornwall coast of Britain. Not only was he wealthy, but he was protected by the Roman government. Into this power arena we now set the life of Jesus, the Jewish Rabbi called Yahshua ben Joseph ben Matthan, who was the great nephew of Joseph of Arimathea. The drama of the life, ministry of Yahshua, His trial by the Sanhedrin, His death by hanging, His resurrection and then the visitations to His disciples in His glorified state before His ascension all are a part of the aura that surrounded His life. It was the priestly dynasty of Ananus the Elder that produced five sons, Eleazar, Jonathan, Theophilus, Mattathias, Ananus, one son-in-law, Joseph Caiphas, and one grandson, Mattathias son of Theophilus as high priests before the fall of Jerusalem in 70 CE. The power of Ananus and the House of Ananus extended clear to 68-69 CE until the demise of this dynastic family during the height of the revolt with Rome. It was this family, the House of Ananus that put Peter and John in prison, captured Peter and many apostles, imprisoned and flogged them. It was the son Jonathan as high priest who put Stephen the deacon to death by stoning, incited King Agrippa I to behead James the brother of John, and capture to kill the Apostle Peter. Then it was the son, Ananus the Younger who staged the event whereby they could declare that James the Just was blaspheming the name of the God of Israel and then they stoned, beat and killed James the Just the brother of Jesus to death. After thirty two years as the reigning high priest of the Hebrew Nazarene Ecclesia and the nasi of the Nazarene Sanhedrin, the family of Ananus sought to exterminate the influence of the family of Jesus. Yet, the Nazarene Ecclesia in turn had the ear and the allegiance of the Zealots, the Essenes, a large company of priests who lived in the Ophel in the Old City of David. They had the sympathy of a majority of the poor and lower class Jews who lived Lower City and the Tyropean Valley. More than that, the Nazarenes also felt that Jonathan the son of Annas, the High Priest, was responsible for the death of Stephen and the persecution of the Nazarenes throughout the wilderness of Perea above Damascus in 35 AD. It was the two sons of Ananus the Elder who sought to anihiliate the Nazarenes during times when the Roman governors were not present in the land of Judea. Is was Jonathan who delivered Stephen the deacon to be stoned to death without the permission of the Roman procurator and Ananus the son of Ananus who had James the Just stoned and beaten to death on the portico of the temple, were both done in a time vacuum when the new Roman governor was still in route to the land of Judea. Roman law forbad the killing of any person in the empire with the consent of the Roman authorities. Both of these times the sons of Ananus the Elder who were the presiding high priests were immediately stripped of their official duties as the high priest and given to the son of a rival Sadducean family. Who allowed James the Just and Simeon ben Cleopas to preside as the high priest of the temple? We doubt that it came with the consent of the high priests of the House of Ananus. By all testimonies, the Nazarenes worshipped in the house of the Lord in the temple of Herod using non-sacrificial ritual that were in accordance with the halachah of the Mosaic Torah law. Yet taking away the thousands of sacrifices in the temple would have been economic suicide for the families of the high priests. This was their “golden goose”. To institute a non-sacrificial system in the temple because the death of the Son of God fulfilled the sin offering sacrifices in the temple would have deprived the Sadducees from the huge profits derived from the sale of the sacrificial animals. At the same time it would make sense that the Romans did allow Jacob (James the Just) and his cousin Simeon ben Cleopas to serve in the position as the high priest because they knew that they commanded the respect of the will of the people during this era. The Romans retained custody of the vestments of the high Priest including the robe and the diadem that was worn in the Holy Place on the Day of Atonement. These garments could only be used by the consent of the Roman government. Jacob and Simeon’s leadership did appease the populous and their role as High Priest brought peace and stability in a country so ripe for revolt. Even more so, Jacob the Just and Simeon ben Cleopas were known for there non-violence and pacifist leadership. They never did pose a threat to the Roman authorities as Jesus did not pose a threat to Pontius Pilate. In respect to the customs of the Jews, the Romans knew that Jacob the Just and Simeon ben Cleopas were of the priestly line of Aaron and such commanded the respect of the Essenes and the Zealots who believed the high priest would only come from the lineage of Zadok, the high priest of King David, and thereby from the lineage of Aaron. John the Baptist, the Essene, was known to have been born in the house of Aaron, and was thereby of the priestly lineage. Jesus, being the cousin to John the Baptist through his mother, Mary, a cousin to Elizabeth, was also born into the priestly lineage of the House of Aaron on her maternal side. Jesus, whose paternal genealogy was of the House of David and of royal stock, was recognized as a legitimate contender for the long sought messiah. Through Jesus’ maternal lineage, he was recognized by the Zealots as the legitimate heir to the role of the High Priest as well as the king of Israel. As was stated early the house of Ananus the Elder had control of the temple high priest position for thirty three out of thirty five years until the reign of King Herod Agrippa I in 41 CE. Then something happened. The newly arrived king came into Jerusalem in a triumphal parade and participated in the rites and sacrifices in the temple of Herod akin to the ancient king of the United Monarchy of Israel, King Solomon. In a vast display of pomp and piety, the citizens were inspired and awed. Then suddenly, King Agrippa I took away the high priest position from Theophilus, son of Ananus (37-41 CE) and gave it to his rival competing family of the House of Boethus. Something was amiss. What was this all about? Theophilus the son of Ananus the Elder (37-41 CE) had just honored and welcomed the newly arrived king into the city and assured him the blessings of his ‘divine’ office and was suddenly as though premeditated removed from office. Understand fully that Agrippa I as a child watched the paranoid actions of his grandfather, Herod the Great, as Herod feared that his throne would be usurped or taken away from him by palace revolt. Can you imagine the fear of this child, Agrippa as he watched his grandmother, Mariamme, the Hasmonean daughter of Alexandros, killed in the palace of Herod and then watched the execution of his father, Aristobulus and his uncle Alexandros both executed in 7 BCE. Only he and his two aunts, Salampsio and Cypros survived of this attempt to destroy fully the Hasmonean family dynasty. Was Ananus, the young priest a part of this plot to exterminate the Hasmoneans or the House of the Maccabees? For whatever reason, the political act of giving the high priest to the rival House of Boethus did not last long under the skillful manipulation of the patriarch, Ananus the Elder. It has been documented that his family and dynasty was the most powerful and wealthiest of all the Sadducean families in Judea. Is it any wonder that to receive the revenues of the temple of Herod was not a political incentive for graft and corruption? Yet there may have been other motives on the part of King Agrippa I. On the other hand, as evil as Theophilus’ brother Jonathan who was high priest from 36-37 CE was, Theophilus appeared to have a kinder heart for the Nazarenes that any other of the House of Ananus. Is it possible that the physician Luke, whom tradition states was a classmate of Saulus, the later Apostle Paul, in the Yeshiva (school) of Gamaliel was also friend and classmate of Theophilus, the son of the former high priest Ananus the Elder? From all appearances, Luke was on a mission to present in his most skillful manner the case of the divine mission of Yahshua ben Yosef (Jesus son of Joseph) and the divine mission by the Holy Spirit (Ruach HaKodesh) of the ministry and mission of the Hebrew Nazarene Ecclesia in Jerusalem. It is possible that these two epistles were sent to Theophilus who had been high priest during the four years of peace after the reign of Caiphas? Was Theophilus, like Gamaliel, a secret follower of the Nazarenes? Theophilus’ brother in law, Caiphas, was the high priest who set Jesus up to be tried before the Jewish Sanhedrin and sentenced to death. It was Jonathan, another brother of Theophilus, who set up James the Just to be attacked and killed by Saulus (the student Paul) on the temple stairs after a debate with Gamaliel over the merits of ending forever the sacrificial system of ‘sin offerings’. It was also Jonathan who set up Stephen the deacon to be tried before the Great Sanhedrin and charged with blasphemy and subsequent death by stoning about 35 CE. It was also Jonathan who gave the rabbinical student Saulus the writ or authority to storm the homes of the Nazarenes and put them in prison about 36 CE. When they began to flee to the land of Perea east of Galilee, it was the high priest Jonathan brother of Theophilus who send the Rabbi Saulus (the Apostle Paul) to Damascus without Roman approval to round up the Nazarenes and bring them back to Jerusalem. Being a Herodian with the same genes as his grandfather, Herod the Great, King Agrippa I was not known to be a friend of the Nazarenes or a friend of the even the Jews. Though he was their king, his power came from the Caesar and any friend of Caesar knew that there were always rivals to topple them from the throne. When Herod the Great died in 4 BCE, the realm of Herod was given to Aristobulus, Agrippa’s father’s three other brothers. Herod Antipas was made tetrarch to rule over Galilee and the east bank of the Jordan. Philip was made tetrarch to the east of Galilee over the region of the Golan Heights in the north- east. Archelaus was given the title of ethnarch ('national leader') over the regions of Samaria and Judea. Agrippa grew up in Rome and was educated with the children of the Julian-Claudian dynasty. His companions were Claudius and Caligula both of whom he befriended and assisted in their gaining the emperor title of Rome. When Philip died without heirs in 37 CE, Tiberius Caesar gave the tetrarchy east of Galilee, the Golan Heights including the province of Syria to Agrippa I, But Tiberius suddenly died on March 16, 37 CE. When the ‘mad’ emperor Caius Caligula ascended to the throne as Caesar of Rome (37-41 CE), Caligula appointed his childhood friend Agrippa I to be given his own kingdom over Syria and Golan that was prior appointed by Tiberius Caesar. Now after forty years, Herod Agrippa was made the first king after his grandfather, King Herod the Great. Two years later (39 CE), Agrippa’s uncle Herod Antipas, the ruler who beheaded John the Baptist, tried to usurp Agrippa’s royal title. Caesar Caligula sent him to the favorite land of Roman exiles, Gaul and Galilee and Perea were given to King Agrippa I. This not only included Galilee, Perea, the region of Syria and the Golan Heights, but now the regions of Samaria and Judea. Herod Agrippa II also knew that the Apostle James the Greater had been preaching since the death of Jesus to the Jews in the Roman Province of Espania (Spain). Here in this province were the descendants of the 4000 political disciples of the slain Hasmoneans aspirant, Judas the Galilean, who led the first direct revolt against Rome in 6 CE (Acts 5:37). This occurred at the same year of the Roman census when young teenager, Yahshua ben Joseph (Jesus son of Joseph) went to the temple at Passover at 6 CE and met with the newly appointed high priest, Ananus the Elder, and the chief elders of Israel in the Great Sanhedrin. Here also in the province of Spain were possibly living the proto-Israelite descendants of the family of Zarah, who was the twin brother of Pharez that came from the union and the womb of Tamar, the wife and daughter-in-law of Judah. These Zaraites, according to some historians, fled from Egypt, not with Moses during the great plagues of Egypt but to Spain with the Scythian prince, Gaodhal the son of the Babylonian educator Niul, who aided and assisted Moses and Aaron with the fleeing Israelites. Some of these Spaniards were also descendants of Milesius, the Scythian descendant of Gaodhal and the descendants of the house of Zarah the son of Judah and brother of Pharez who lived along the coast of Spain. Milesius was a mercenary leader of the armies of Pharaoh when the prophet Jeremiah fled to Egypt with Tamar Tephi, the daughter of Zedekiah the last king of Judah. After Judean revolt and destruction of the Judean capital city, Jerusalem and the Temple of Solomon by the Babylonian forces of Nebuchadnezzar the Great, the prophet Jeremiah fled to Egypt in exile to put the daughters of Zedekiah in the custody of the Pharaoh of Egypt. According to Irish royal history, the Jewish princess Tamar Tephi married Heremon the son of Milesius and then traveled to Spain where Milesius’ and Heremon’s ancestors, the union of the Gaodhalites and the Zarahites lived along the Atlantic coast near the coastal city of Brigance, Spain. From Spain to Ireland, the Milesius and Hermon traveled and started the royal dynasty of Ireland. According to the biblical story in the Torah, Judah the son of Israel (Yacov), married Tamar, his two deceased son’s wife and from them were born the twins, Zarah and Pharez. The Hebrew story depicts the uncertain role of who was to be the first- born son. According to the story Zarah was the first to reach his hand out of the womb and a scarlet thread was tied to it by the midwife. Yet Pharez moved ahead of Zarah in utero and was officially born as the first born. 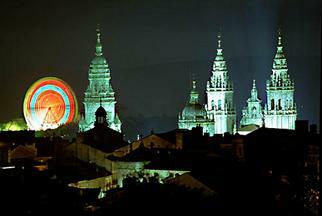 Is there a reason why the ancient Roman Spaniards placed the bones of the Apostle at the site of the cathedral, Santiago de Compostela, near the ancient home of the Gaodhalites and the Milesians on the Atlantic coast near Brigance? The high priest Theophilus, the son of Ananus, was removed from the high priest the same year that James the Greater was beheaded. Is there a connection? Was James the brother of John looked upon as a revolutionary within the rapidly growing sect of the Nazarenes? Was he looked upon as potentially fomenting a revolt amongst the descendants of the followers of the Maccabean aspirant to the throne of Herod, Judas the Galilean, in the land of the descendants of Zarah the Judaite, the twin brother of Pharez, the ancestor of King David and the Jewish messiah, Jesus the son of David? Was James the brother of John seen as a threat to the stability of the throne of Herod Agrippa I? During the rulership of Herod Agrippa I, he appointed a high priest every year, Simon, or Cantheras, son of Bœthus (41-42 CE), Mattathias, son of Ananus (43-44 CE), and Elioneus, son of Kantheras (44-45 CE). Is there a reason why the House of Ananus was able to keep the high priestly position within its possession from its rivals, the Houses of Bœthus and Kantheras? According to the chroniclers of the Nazarenes, reputed to be the physician and gospel writer Luke, the divine hand of Justice was felt. Standing before an audience at the Roman Amphitheatre in Caesarea King Agrippa II was suddenly seized with pain and died in agony at the very moment he was being hailed as a ‘god’ before the Jews and a ‘pagan’ audience draped in a robe of silver that glistened in the brilliant rays of the morning sun. Here in the Synagogue of the Nazarenes built over the House with the Upper Room, James the Just and the Sanhedrin of the Nazarene Ecclesia voted by lot to place the provinces of the then known world under the apostolic leaders of the following apostles. Mattathias was to stay in Jerusalem. The Gospel of the Risen Christ had been taken early to the imperial city of Rome by Barnabus, taken to the British Isles where the ancient Israelites were mining the tin mines off the coast of Cornwall by Joseph of Arimathea and to the descendants of Zarah through Gaodhal and Milesius to the Brigance on the northern Atlantic coastline of the Roman province of Espania by James the brother of John. Now the gospel was to be taken to the realms of the uttermost parts of the world. That Simeon ben Cleopas lived to be a ripe old age of 120 years in attested to in historical record. Eusebius again is quoting Hegesippus gives the history that during the reign of Trajan that Simeon ben Cleopas was accused by other royal Davidian descendants who like he were part of those hunted by the Romans trying to kill of all the descendants of David. The “Davidians” were a potential threat to the Caesar of Rome as they also were legitimate heirs to the throne of Judah. Jesus of the House of Joseph, known Davidians in the land of Judea, left a heritage to their family’s descendants of not only being accursed by the House of Ananus and the temple authorities in Jerusalem but also were hunted by the Roman authorities for centuries. During the reign of Trajan (98 – 117 CE) every Davidian was pursued in the Roman provinces. Apparently one of these ‘heretics’ of Davidian blood informed the Roman authorities that Simeon ben Cleopas was a Davidian and a follower of Yahshua. By this date, the followers were known to the Romans as Christians at least to Eusebius two centuries later. Here is the account by Hegesippus. This statement is collaborated by another statement of Hegesippus. These two statements produce some interesting conflicts in the genealogies of Jesus’ family. These included four brothers and at least two sisters. What we have learned is that James the Just was the son of Joseph but not necessarily the son of Mary. We also know that Simeon was the son of Cleopas, the brother of Joseph yet was possibly but not necessarily the son of Mary the mother of Jesus. According to the history of Simeon ben Cleopas, he suffered the martyr’s death by crucifixion at the age of 120 years of age in the reign of Trajan and Atticus who was the provincial governor of Judea. The first thing that we can assume is that Simeon was living back in Judea and not Perea during the reign of Trajan as the provincial governor of Judea was a partner to Simeon’s martyrdom. What is the significance of this? If Simeon died at the age of 120 at the latest date of 108 CE, then his birth would have been 12 CE or six years older than Jesus whose birth is estimated to be about 6 CE. If this is true, then Mary the mother of Jesus could not have been Simeon’s mother as this was before the birth of Yahshua when Mary was fourteen and she would have been only eight when Simeon was born. Was Simeon ben Cleopas the son of Cleopas, the uncle of Jesus before Jesus was born? The rest of the story is still yet to be told.